Our tincture contains raw cannabinoids that are extracted using supercritical CO2 extraction and then later infused with a rich terpene blend to create a unique final product. A perfect blend of CBD and THC, this lightly sweetened tincture combines infused MCT (fractionated coconut) oil with 150 mg of CBD and 150 mg of THC. Each Yummi Karma tincture is designed for a specific purpose with differing levels of THC and CBD, or an equal combination of both. 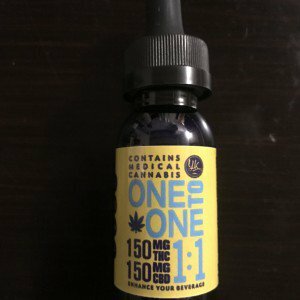 Maintain your balance with our One to One 150mg CBD: 150mg THC tincture and experience the subtle effects and high level therapeutic benefits. Explore all the tinctures available and learn more about their general uses. There are a number of ways in which Yummi Karma tincture can be used. Many people consume the tincture straight from the dropper. It can be swallowed immediately, or placed under the tongue and swallowed after a minute. This is called the sublingual method, and it allows the effects to kick in quicker. Another popular option is to add tincture to your favorite beverage. The glycerin-base makes it sweet, so it especially works well in teas and juices.